The DVI-U-CPU computer module links external keyboard, video, mouse, and audio interfaces to the ControlCenter-Digital. Combine signals, process them, and use CAT cables to transmit the signals to the ControlCenter-Digital. With the "U" variant it is possible to transmit transparent USB without any additional devices. There is no need for additional cables or devices. The computer modules link external keyboard, video, mouse, USB2 and audio interfaces to the DVICenter system. 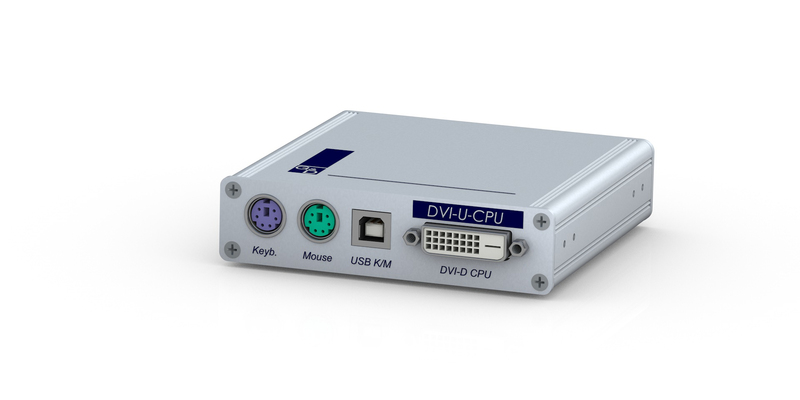 DVI-U-CPUs combine signals, process them, and use CAT cables to transmit the signals to the DVICenter. Any DVI-U-CPU has a unique ID that helps identifying the device within a DVICenter system.